The feature is broken, but there are workarounds. It’s absolutely frustrating when you set out on a task that seems like it should work, and then wind up wondering if it’s your fault. This is the case with Photos 3.0 for macOS and its broken workflow for creating slideshows: it sorts images and videos in random order. Select some items or have no items selected while viewing a regular or smart album to select the whole album. Create a slideshow. In Photos, that’s File > Create > Slideshow. An entry is created in the Projects list with the name you choose. And, hurray, the pictures and movies would be referenced in a slideshow view in the order they appeared in the album. Photos 3.0 inexplicably broke this arrangement, and it’s remained broken since its introduction in High Sierra in 2017. Until Apple fixes this issue—perhaps in the release of Photos with the upcoming Mojave?—you have a few workarounds, none of which are quite as ideal, but all of which work. Manually sort the slideshow. After creating a slideshow, you can use the thumbnails at the bottom to re-arrange media into the order you want. This is tedious and unnecessary, but lets you use all the slideshow features. Use the Slideshow feature in any view. This feature isn’t always apparent, but you can create an ad hoc slideshow by selecting any set of images in any view and Control-clicking. Then select Play Slideshow. In an album, you can also click the Slideshow link at top. You don’t get all the controls and options in a separate slideshow Project, but you can pick a theme and music. 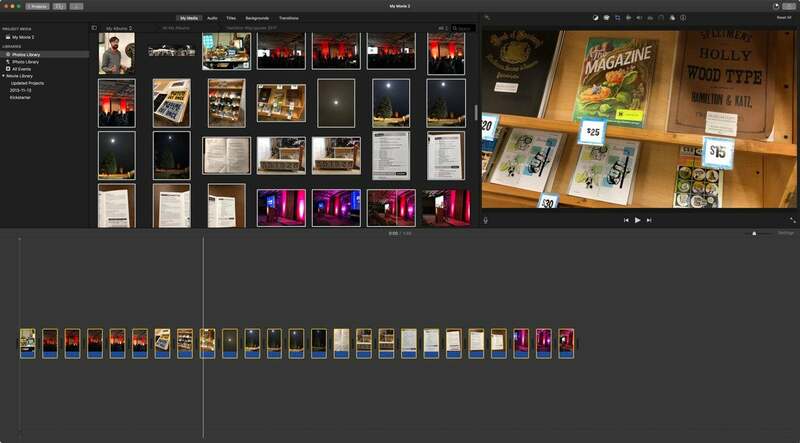 iMovie is an option to create a slideshow, albeit as a fixed movie.